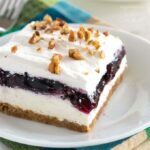 Blueberry Lush – a (nearly) no-bake blueberry layered dessert sure to delight everyone who tries it! Blueberry cheesecake meets blueberry fluff in this light one-pan dessert with a graham cracker pecan crust. Cookout season has officially started! Barbecues are one of my favorite gatherings whether it’s a backyard BBQ or beach BBQ. They’re as fun and breezy as summertime. Part of the reason is that everyone brings a dish to pass so you get a feast without all the work! You may have also heard this recipe referred to as Blueberry Delight or Blueberry Yum Yum. 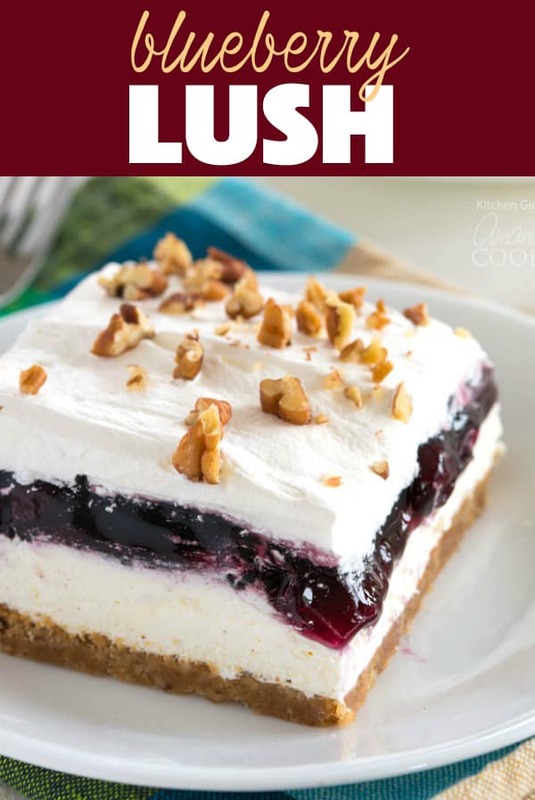 Lush recipes are all the rage right now, with so many options to choose from like our Lemon Lush, Mocha Lush, Coconut Cream Lush, or our Banana Cream Lush, this blueberry lush recipe will be topping the charts in no time. 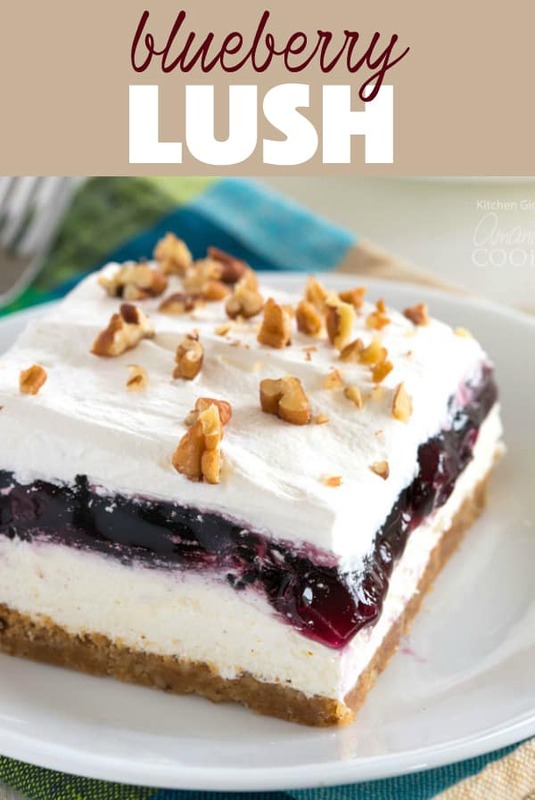 I always like to have a go-to savory recipe like Tuna Pasta Salad and a dessert recipe like this Blueberry Lush in my arsenal. It’s almost no-bake, but the crust needs about 5 minutes in the oven to set up. It’s a graham cracker-pecan crust and I promise the toasty, nutty flavor is worth it! If needed, you can leave out the nuts and use all graham crackers. You can even substitute another cookie for the crust such as vanilla wafers or shortbread cookies. It’s a very versatile dessert! Just be sure to let the crust cool completely before adding the next layer. The middle layer is cream cheese based. Think no-bake cheesecake, but even fluffier. If you love the rich flavor of cheesecake, try my No-Bake Pineapple Cheesecake Bars instead. This blueberry lush has a very light texture and flavor, which lets the blueberries and toasty crust shine. Use well-softened cream cheese so it will blend smoothly with the whipped topping. Homemade whipped cream will work as well if you prefer not to use cool whip. You’ll need about 3 cups whipped (approximately 1.5 cups of cream). 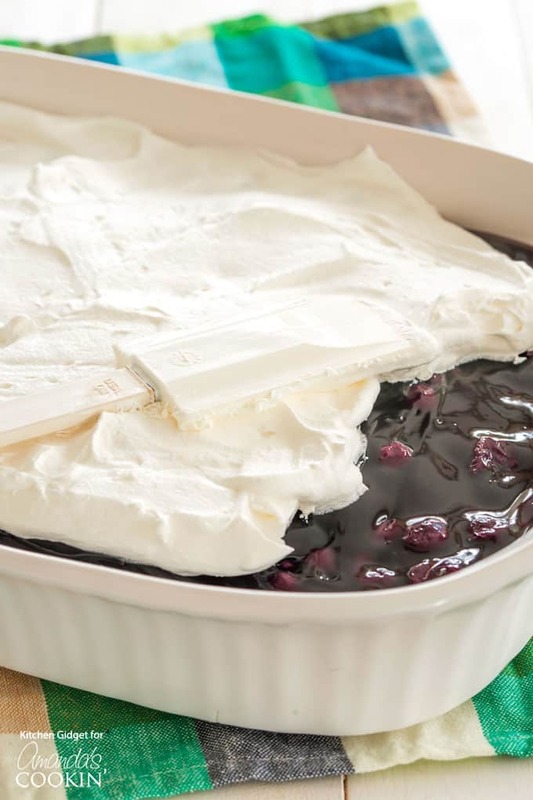 The third layer is simply blueberry pie filling (how easy is that!). Of course, you can use any flavor pie filling you like. It won’t be blueberry delight, but cherry or even lemon would be amazing! Lastly, it’s topped off with a layer of whipped topping (or homemade whipped cream). I also like to add chopped pecans for extra crunch and to highlight the delicious crust. 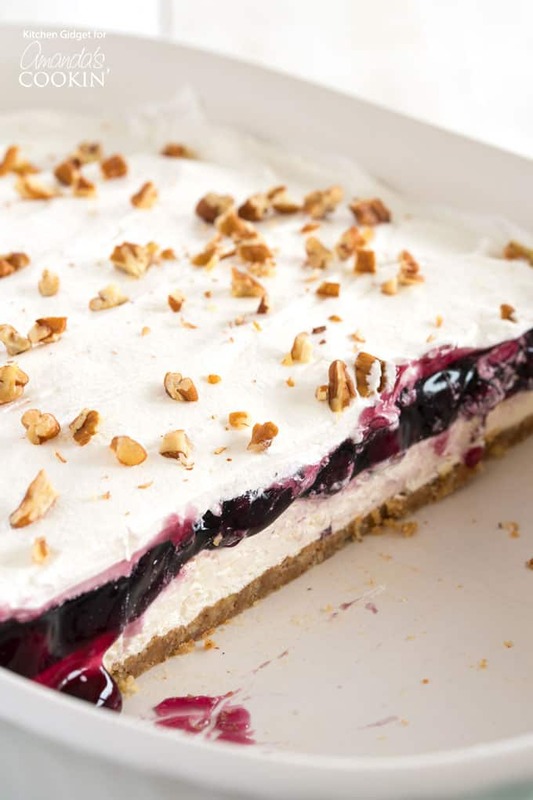 Let it all chill and you have a blueberry layered dessert for all your summer parties! 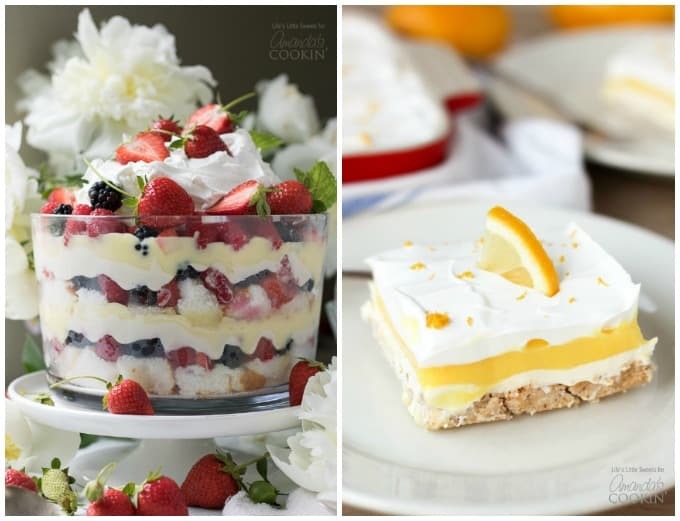 Be sure to check out more summer dessert recipes like our Mixed Berry Trifle perfect for Fourth of July parties or potlucks. 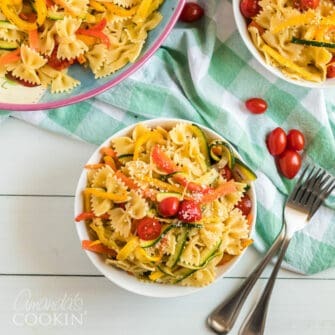 Another crowd favorite is our Lemon Lush recipe. Bursting with lemon flavor, this one-pan dessert is always a hit at any party! 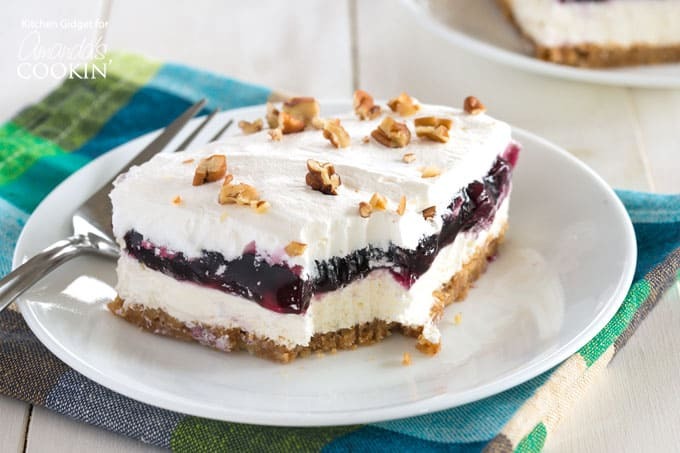 An easy blueberry layered dessert featuring a graham cracker pecan crust, cream cheese layer, blueberry pie filling and whipped topping. Light and fluffy dessert for a crowd! Preheat oven to 350°F. In a food processor, blend the graham crackers and pecans until finely chopped. Stir in butter and sugar until well combined and press into the bottom of a 13x9 pan. Bake for 8 minutes and let cool completely. In a large bowl, beat cream cheese and powdered sugar until smooth. Using 1 container of whipped topping, beat in about 1 cup so there are no lumps. Fold in the remaining whipped topping from the container and spread the cream cheese mixture over crust. Add the blueberry pie filling in an even layer. Top with remaining container of whipped topping. Garnish with chopped pecans if desired. Cover and chill for at least 2 hours or overnight.